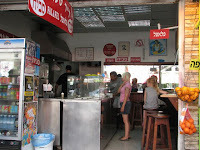 Address: 45 King George st.
Dr. Sa'adia is the favourite falafel eatery of many Tel Avivians. His falafel balls are super tasty and hot right from the oil. You get your meal in a thick pita filled with hummus and fresh salads and hot sauce if you like. It's on King George st. next to the intersection with Bograshov. I ate here when I visited Tel Aviv on birthright! This was my favorite falafel place because of all the varieties of toppings/salad! I was looking for places to take my mom in a couple of weeks when we visit tel aviv and I wanted to take her here but couldn't remember the location - thank you so much for posting it!! I love your blog!